The Invitation | David and Morgan Are Gettin' Hitched! 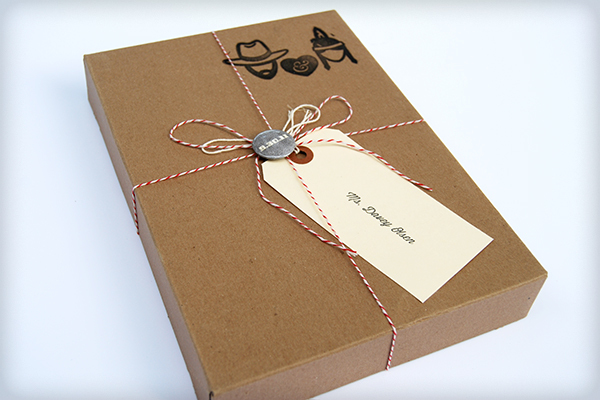 But, as promised, I wanted to post a few shots of the invitation! A lot of love went into this piece, along with some major compromising of my hyper-feminine style with David’s hyper-masculine style, and lots and lots of time on the part of one of my very greatest friends, Ariella. We wanted to come up with something totally different for this invitation. Something that– no matter how hard our guests tried– they just couldn’t throw away. 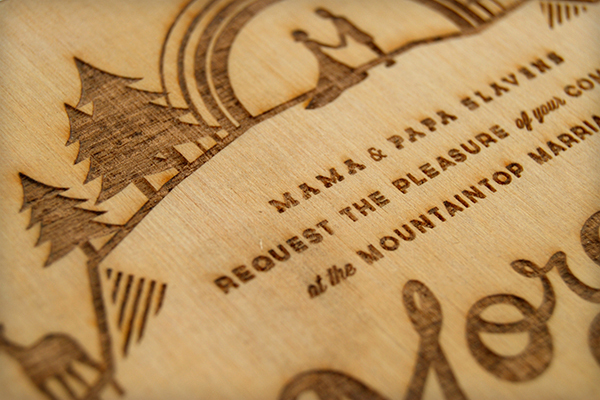 So we decided we’d experiment a bit with material, and we landed on laser engraving our invitation into pieces of wood. We found the wood we wanted as plywood sheets at Lowes, and called our friend who had access to a laser cutter. With a little bit of planning and testing, she was able to cut them down to size and get the perfect “print,” exactly what we were looking for. 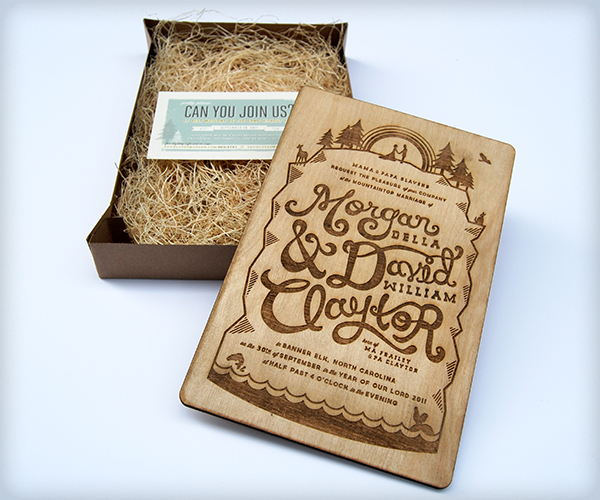 With the design of the invitation, we really wanted our personalities to come through. I mean, this was THE piece! And since we were laser engraving it, the pressure was on. 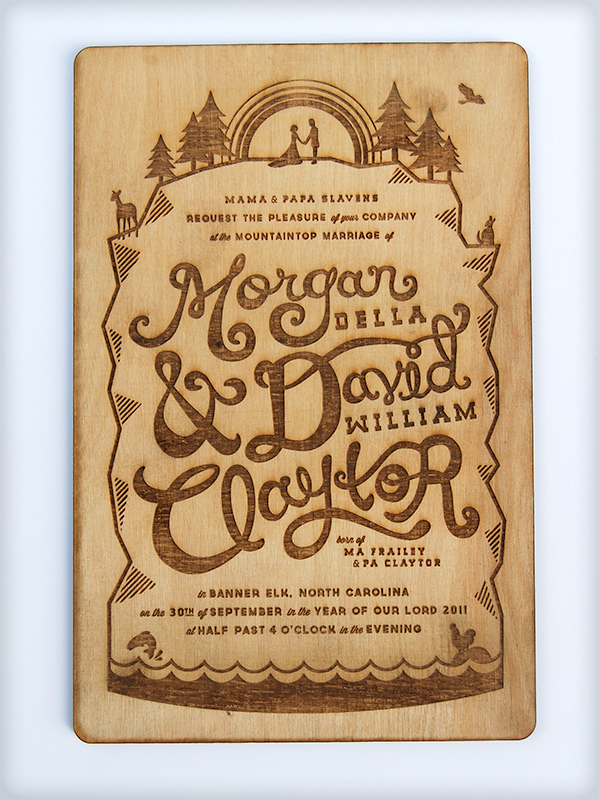 David and I drew and vectored the typography that reads “Morgan & David Claytor” and the other illustrative components of the piece. 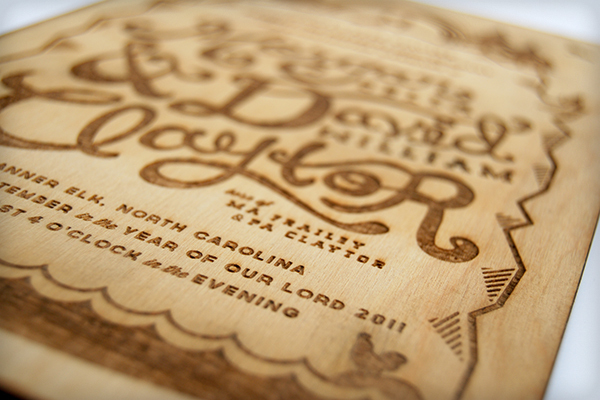 The other type used on the invite (and throughout a lot of our wedding stuffs) came from Lost Type Co-Op, an incredible donation-based font supplier dedicated to creating and preserving delicious typography and making it accessible to those who may not be able to afford it otherwise. Love those dudes. For the packaging, we ordered simple kraft boxes and excelsior (that fluffy wood shaving stuff), and went to town. We got a big roll of the red and white butcher string at Michaels, tags from Office Depot, and ordered buttons from Pure Buttons to remind guests of the date. 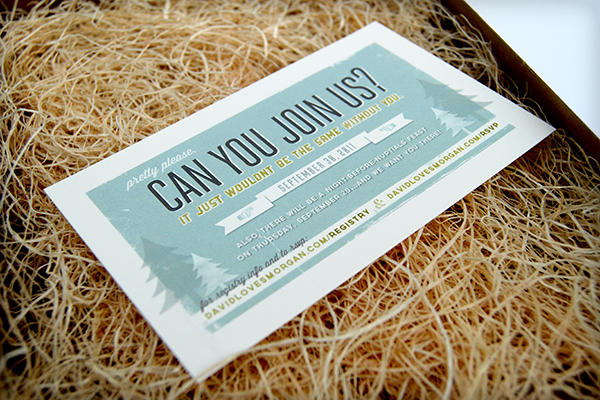 We included small one-sided cards that had the website info on it, since that is how we were accepting RSVPs. No postage required! Instead of using a calligrapher for the addresses, we printed them out in a script font (thanks to Lost Type Co-Op), and transferred them on using a blender pen from our local art store.